The Debug (printf) Viewer window displays data streams that are transmitted sequentially through the ITM Stimulus Port 0. Enable ITM Stimulus Port 0. Add ITM Port register definitions to your source code. Add an fputc function to your source code that writes to the ITM Port 0 register. The fputc function enables printf to output messages. Add your debugging trace messages to your source code using printf. Set the ITM Port 0 to capture the information. Clear the Port 7..0 privilege bit to access ITM Port 0 from User mode. 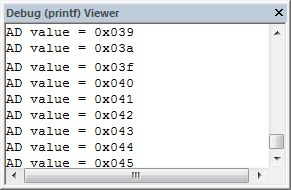 Open the View - Serial Windows - Debug (printf) Viewer window. ITM Stimulus Ports can be monitored in the Instruction Trace Window, where ITM Port 0 is shown as well. Consult Configure Cortex-M Target of the MDK-Primer for information on how to retarget the output.